When you understand that images on Instagram are only 612 pixels by 612 pixels, it doesn't seem to make sense to create prints from photos on Instagram, even though Instacanv.as makes it very convenient to do. However, Instacanv.as has an answer to that. They claim to use a resizing and optimization algorithm that makes for "crystal clear, crisp images". That sounds like a lot of marketing but my experience was that they did a really good job. My photo was on canvas and was somewhat "painting-like" after my post-processing so there was some room for error, but I could find no pixelation and the printed image looks like the piece of art that I wanted it to be. 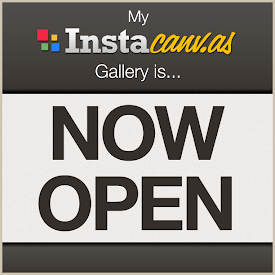 Another benefit of Instacanv.as is that you can sell prints of your own. You pick what Instavanv.as photos to add to your gallery and you can add hashtags to your photos on Instacanv.as that are different than what you use on Instagram, though the Instagram hashtags are added by default. You can also enter a caption and assign a category for each photo to make the photos more discoverable. If you sell an item, which can be a canvas, a framed print, a prism (a 6x6 acrylic paperweight), greeting cards, or an iPhone case, you get 20% of the sales price, which really isn't bad since they handle the display, production, shipping, and collection the money. As of the time I write this, I haven't yet sold any of my photos yet, and I don't know if I will, but it's nice having that possibility for very little effort (aside from the effort it took to create the image in the first place). Shortcuts on the iPhone is one of those features that you may not know about but are extremely handy when typing on small iPhone keyboard. Shortcuts, however, aren't very visible because they are tucked away in the Settings app. This little feature can change a quick "omw" to "On my way." or "ctn" to "Can't talk now, in a meeting." From Settings, choose General, then choose Keyboard. Scroll to the bottom and you'll see Shortcuts and an option called Add New Shortcut... If you click Add New Shortcut..., you can enter a phrase and a shortcut for it. The shortcut field is optional, which sounds odd at first. However, it allows you to enter a phrase that you don't want autocorrect to change to something else. One time I texted my wife "Woohoo" and autocorrect changed it to "Elohim", a Hebrew word for God. In the context, it didn't quite make sense. If I had "woohoo" as a phrase, even without a shortcut, my "Woohoo" would have come across the same way I entered it.